If you are looking for a mattress that is going to give you the good night’s sleep that you deserve then you have found what you are looking for! The Casper Mattress comprises four luxurious foam layers constructed in perfect symmetry. As well as creating an optimum sleep environment for adults, Casper mattresses are also perfect for babies and children. With a removable polyester mattress cover you can be certain that you can keep your mattress fresh and clean. The cover is also very breathable and won’t bunch up underneath you if you are someone who moves around in the night! The upper layer is a made up of thick response foam, which rests on top of a second layer of equally thick memory foam. The third layer is made up of poly foam and responds very quickly to pressure. This third layer also acts as a cushion between the soft top layers and the fourth and final layer, which is harder high density poly foam. The fourth layer provides support to the rest of the mattress and also helps to give the mattress its shape. 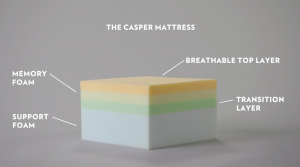 The Casper mattress is made of entirely vegan materials and is designed to be cooling, ensuring that heat flows away from your body as you sleep. The Casper mattress has been expertly designed and created by a team of engineers, designers and those all important sleep testers! It is 24 cm high and can be ordered to fit all normal bed sizes. The cost of the Casper mattress reflects the high quality and care that goes into creating each and every one of them. These prices include VAT, as well as shipping and handling. The Casper mattress will be delivered within 2 – 5 days, and free shipping is included with every order. That means you can effortlessly place your order and be enjoying it within a few days! Casper offer a 100 day trial period in which you can decide for yourself whether you love your new mattress. If you decide during this time that it isn’t for you, then they will come and collect it for free and provide a full refund. The ten year warranty offered by the company includes certain repairs that may become necessary during this time, and in some instances the entire mattress will simply be replaced with a new one. We rate this mattress a solid 9 out of 10! The high score that we have assigned reflects the incredible quality of the product itself, as well as Casper’s commitment to customer service and their easy to navigate website. Another deciding factor in giving this mattress such a high rating is how well it is able to isolate motion when two people are sharing the bed. This is important if your partner regularly disrupts your sleep, or vice versa! Regardless of what position you prefer to sleep in, the Casper mattress will support you whilst also giving a little bit of bounce. The Casper mattress is truly a game changer and an abundance of positive reviews point to the fact that it can really help to improve your sleep and enhance your night-time comfort. What setup do you recommend for the Casper mattress? We designed the Casper mattress to be versatile, so it can work with all standard foundations. As with all foam beds, you want as much direct support under the mattress as possible. A wooden slatted or platform bed offers the most support. How big is the box that the Casper mattress ships in? All Casper mattress sizes ship in our standard box of 47 x 47 x 108 centimetres. Depending on bed size, the total weight of the box ranges from 27.2 kilograms to 47.2 kilograms. Shop for your Casper mattress now!